One of the pastries most ubiquitous with Spain are churros. 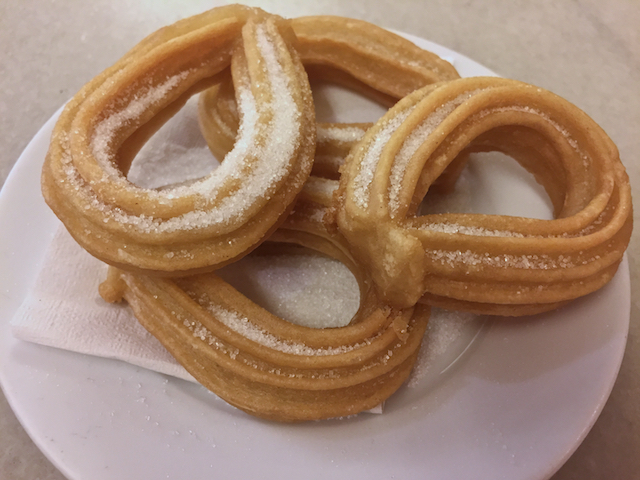 Traditionally churros and chocolate are a popular Spanish breakfast item, or an early morning snack after a long night out. 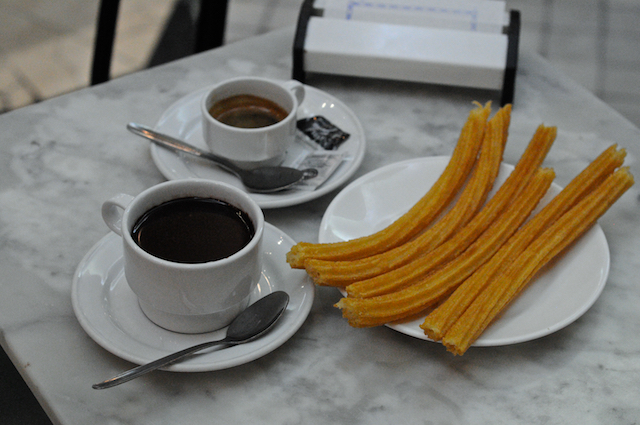 When I booked my trip, I was on a quest to seek out all of the churros and chocolate in Spain. I mean how could anyone possibly start the day without churros and chocolate?! Churros are fried pastry dough, usually Choux, that are rolled in sugar and cinnamon. They are said to be the invention of Spanish shepherds, since the fried dough was easy to make in the mountains. Chocolate comes from the cacao bean, which was first discovered by Christopher Columbus during his expedition to the the Americas in 1492. 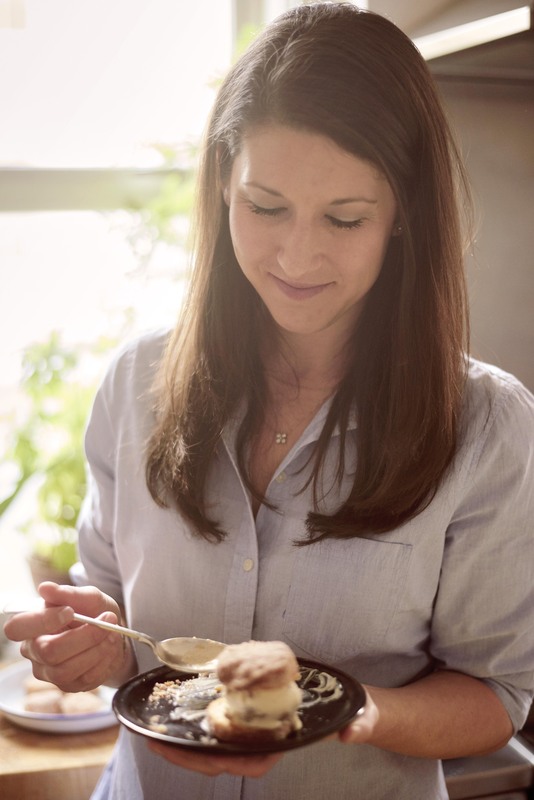 However it was Spanish conquistador Hernán Cortés, introduced to cacao by the Aztecs, who brought it back to Spain where Spanish Monks added cane sugar to make it sweet. Until coffee, chocolate was the favorite drink of Spain. 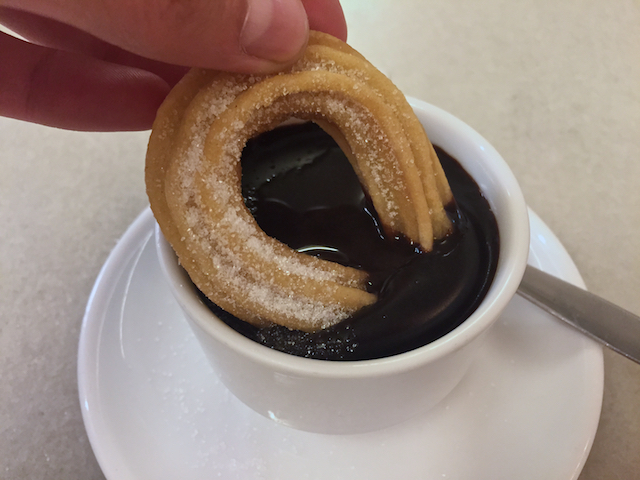 I’m no stranger to a churro (I still dream about the dulce de leche stuffed ones in South America), but my first experience with the Spanish style accompanied by chocolate happened at the famed Chocolatería San Ginés, a place recommended by many friends when I announced I was in route to Madrid. Founded in 1894, Chocolatería San Ginés is one of the oldest chocolate shops in Madrid. Opened 24 hours a day, any time is the right time for a visit to Chocolatería San Ginés! Winding my way through the alleys just off the city center, I found the shop. Sugar wafted in the air as I opened the door. The long thin churro sticks were piled on a small plate and placed down on the table next to a mug of thick, rich dark chocolate. Carefully dunking each one to ensure full chocolate coverage, I ate the whole plate in around five minutes flat. Even with my fully dipped churros, I was left with a half mug of dark chocolate. I looked around to see if anyone else was just straight up guzzling their left over chocolate. No one seated near me was giving any real sign as to proper churro-chocolate etiquette. It just seemed so wrong to leave chocolate like that. So I drank it. When in Spain! Granja Viader, established in 1870, is one of the oldest cafes in Barcelona. Located off the bustling Las Ramblas, walking into the café is a warm and inviting respite from the hustle of tourists. The café is well known for the invention of Cacaolat, a chocolate drink that is popular in Catalonia region. The churros at Granja Viader are twisted and heavily sprinkled in sugar. Served alongside a piping(!!) hot mug of dark chocolate, my second churros and chocolate experience was just as nirvanic as the first. Spain is known for its late night schedules with Madrid and Barcelona both being known for their nightlife. Next time you’re traveling to either city, treat yourself to a breakfast of churros and chocolate at Chocolatería San Ginés in Madrid or Granja Viader in Barcelona. It’ll be a good remedy for the late night, or a sweet little night cap if you’re coming in off a late night! You could even go for breakfast in the morning, and return for an afternoon snack. I won’t judge, and I promise, it’s worth every drop! 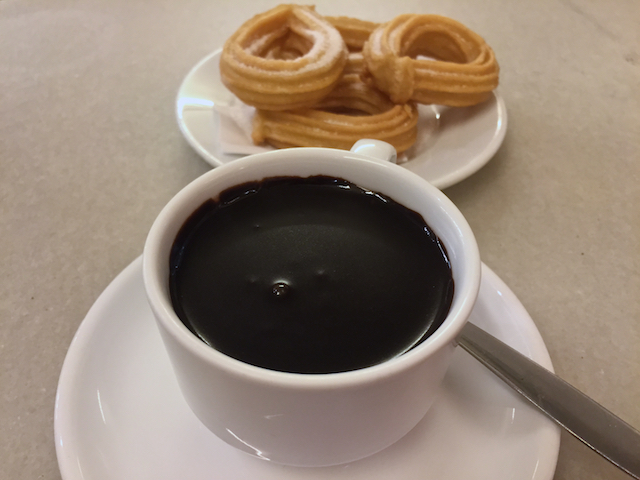 Have you tried churros and chocolate in Spain? What was your favorite? Never been to Spain… how sad. i have always said i could never get enough chocolate… now i know somewhere… i could do that.